Posted by Dave Emory ⋅ September 13, 2017Post a comment Email This Post Print This Post Tweet This! COMMENT: Supplementing recent thoughts about the events in, and subsequent to, Charlottesville, we note a recent high-profile assassination in India. Intrepid journalist Gauri Lankesh was shot to death by an as-yet-unidentified assailant. Ms. Lankesh was fiercely critical of the Hindutva fascist government of Narendra Modi. (Hindutva is a Hindu nationalist manifestation of fascism, formalized by V.D. Savarkar in the early 1920’s. Modi’s BJP is a political cat’s paw for the RSS, the Hindutva fascist organization launched by Savarkar and propelled by admirers of Hitler and Mussolini. It was the RSS that murdered Gandhi.) 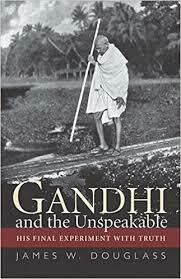 For excellent background on the assassination of Gandhi and the Hindutva fascist forces that engendered that, we heartily recommend James Douglass’ work Gandhi and the Unspeakable. We will be highlighting this work in the not-too-distant future. In FTR #’s 972 and 973, we underscored the grotesque dynamic manifesting in Charlottesville, with the mainstream media, the so-called progressive sector, the mainstream media and the GOP hypocritically condemning the fascists protesting the proposed removal of a statue of Robert E. Lee. All of the above have prostituted themselves to the same forces. Underlining the grotesque, hypocritical nature of the so-called progressive sector, the so-called “alternative” media and the mainstream media is their orgiastic fawning over Nazi fellow-traveler Glenn Greenwald and his journalistic financial angel Pierre Omidyar. Omidyar helped finance the Maidan coup in Ukraine, which brought to power Ukrainian fascists evolved from the OUN/B. Omidyar worked with U.S. Agency for International Development–a frequent vehicle for U.S. covert operation–to effect the Maidan coup. Omidyar has now partnered with the inappropriately-named National Endowment for Democracy to further his ends. NED is little more than a front for continued covert operations. Omidyar’s charges in Ukraine have been complicit in the murder of journalists critical of their activities. Omidyar’s OUN/B successor associates in Ukraine have worked to intimidate journalists with whom they disagree, tarring them with the useful sobriquet of “Kremlin/Russian” dupes. Ms. Lankesh’s murder was the latest in a string of killings of journalist critical of Modi/BJP/RSS. In short, Omidyar has worked to elevate political forces that violently suppress those who dare to “tell truth to power.” That such as he could become icons of journalistic integrity speaks volumes for the depths to which our society has descended. SHAME! 1a. Ukraine Spy Agency ‘May Have Seen Planting of Bomb that Killed Journalist’” by Alec Luhn; The Guardian; 5/10/2017. The makers of “Killing Pavel” tracked down new surveillance footage not found by police. It gives fresh details of the apparent killers, who returned to the scene the next morning shortly before Sheremet got into his doomed vehicle. In his last blogpost for the Ukrainian Pravda newspaper, Sheremet said some militia commanders and veterans of the conflict with pro-Moscow rebels in eastern Ukraine had escaped punishment for other crimes. Sheremet’s partner, Olena Prytula, co-founded the paper with Gongadze, whose brutal murder ignited national outrage. . . .
. . . . The killing caused a major scandal, and American FBI specialists were brought in to help identify the explosives. The United Nations deputy high commissioner for human rights, Kate Gilmore, said Sheremet’s murder would be a “test of the ability and willingness of Ukraine’s institutions to investigate assaults on media freedom”. . . .
1c. “EBay Shrugged: Pierre Omidyar Believes there Should Be No Philanthropy Without Profit” by Mark Ames; Pando Daily; 5/31/2014. This week, India’s newly-elected ultranationalist leader Narendra Modi unveiled his cabinet, three-quarters of whom come from a fascist paramilitary outfit, the RSS (Rashtriya Swayamsevak Sangh) — including one minister accused by police last year of inciting deadly Hindu-Muslim violence that left over 50 dead. The RSS was founded in 1925 by open admirers of Mussolini and Hitler; in 1948, an RSS member assassinated pacifist Mahatma Gandhi. In 1992, it was the RSS that organized the destruction of the Ayodha Mosque, leaving 2000 dead, mostly Muslims; and in 2002, the RSS played a key role in the mass-murders of minority Muslims in Gujarat, according to Human Rights Watch, when the state of Gujarat was ruled by Narendra Modi — himself a product of the RSS. Earlier this week, Pando reported that Modi’s election received help from unlikely sources in Silicon Valley including Google, and to a much more serious extent, Omidyar Network, the philanthropy fund of eBay billionaire and First Look publisher Pierre Omidyar. From 2009 through February of this year, Omidyar Network India Advisers was headed by Jayant Sinha, a longtime Modi adviser and newly-elected MP in Modi’s ultranationalist BJP party ticket. The Omidyar Network partner and managing director played a double role, investing funds in Indian nonprofits and for-profits, some with distinctly political agendas; while privately, the Omidyar man “worked in Modi’s team” in 2012-13, and served as director in the ultranationalist BJP party’s main think tank on security and economic policy, the India Foundation. This week, Modi appointed the head of the India Foundation, former intelligence chief Ajit Doval, as his National Security Advisor. 1b. Pierre Omid­yar–Glenn Greenwald’s finan­cial angel–helped finance the Ukrain­ian coup, along with AID. The lat­ter is a fre­quent cover for U.S. intel­li­gence activities. . . . . Pando has con­firmed that the Amer­i­can gov­ern­ment – in the form of the US Agency for Inter­na­tional Devel­op­ment (USAID) – played a major role in fund­ing oppo­si­tion groups prior to the rev­o­lu­tion. More­over, a large per­cent­age of the rest of the fund­ing to those same groups came from a US bil­lion­aire who has pre­vi­ously worked closely with US gov­ern­ment agen­cies to fur­ther his own busi­ness inter­ests. Accord­ing to finan­cial dis­clo­sures and reports seen by Pando, the founder and pub­lisher of Glenn Greenwald’s government-bashing blog,“The Inter­cept,” co-invested with the US gov­ern­ment to help fund regime change in Ukraine. When the rev­o­lu­tion came to Ukraine, neo-fascists played a front-center role in over­throw­ing the country’s pres­i­dent. But the real polit­i­cal power rests with Ukraine’s pro-western neolib­er­als. . . . . In 1992, after the col­lapse of the Soviet Union, Rybachuk moved to the newly-formed Ukraine Cen­tral Bank, head­ing the for­eign rela­tions depart­ment under Cen­tral Bank chief and future Orange Rev­o­lu­tion leader Vik­tor Yushchenko. In his cen­tral bank post, Rybachuk estab­lished close friendly ties with west­ern gov­ern­ment and finan­cial aid insti­tu­tions, as well as proto-Omidyar fig­ures like George Soros, who funded many of the NGOs involved in “color rev­o­lu­tions” includ­ing small dona­tions to the same Ukraine NGOs that Omid­yar backed. (Like Omid­yar Net­work does today, Soros’ char­ity arms—Open Soci­ety and Renais­sance Foundation—publicly preached trans­parency and good gov­ern­ment in places like Rus­sia dur­ing the Yeltsin years, while Soros’ finan­cial arm spec­u­lated on Russ­ian debt and par­tic­i­pated in scandal-plagued auc­tions of state assets.) In early 2005, Orange Rev­o­lu­tion leader Yushchenko became Ukraine’s pres­i­dent, and he appointed Rybachuk deputy prime min­is­ter in charge of inte­grat­ing Ukraine into the EU, NATO, and other west­ern insti­tu­tions. Rybachuk also pushed for the mass-privatization of Ukraine’s remain­ing state hold­ings. Over the next sev­eral years, Rybachuk was shifted around Pres­i­dent Yushchenko’s embat­tled admin­is­tra­tion, torn by inter­nal divi­sions. In 2010, Yushchenko lost the pres­i­dency to recently-overthrown Vik­tor Yanukovych, and a year later, Rybachuk was on Omidyar’s and USAID’s pay­roll, prepar­ing for the next Orange Rev­o­lu­tion. Some of Omidyar’s funds were specif­i­cally ear­marked for cov­er­ing the costs of set­ting up Rybachuk’s “clean up par­lia­ment” NGOs in Ukraine’s regional cen­ters. Shortly after the Euro­maidan demon­stra­tions erupted last Novem­ber, Ukraine’s Inte­rior Min­istry opened up a money laun­der­ing inves­ti­ga­tion into Rybachuk’s NGOs, drag­ging Omidyar’s name into the high-stakes polit­i­cal strug­gle. Accord­ing to a Kyiv Post arti­cle on Feb­ru­ary 10 titled, “Rybachuk: Democracy-promoting non­govern­men­tal orga­ni­za­tion faces ‘ridicu­lous’ investigation”: “Police are inves­ti­gat­ing Cen­ter UA, a public-sector watch­dog funded by West­ern donors, on sus­pi­cion of money laun­der­ing, the group said. The group’s leader, Oleh Rybachuk, said it appears that author­i­ties, with the probe, are try­ing to warn other non­govern­men­tal orga­ni­za­tions that seek to pro­mote democ­racy, trans­parency, free speech and human rights in Ukraine. “Accord­ing to Cen­ter UA, the Kyiv eco­nomic crimes unit of the Inte­rior Min­istry started the inves­ti­ga­tion on Dec. 11. Recently, how­ever, inves­ti­ga­tors stepped up their efforts, ques­tion­ing some 200 wit­nesses. “… Cen­ter UA received more than $500,000 in 2012, accord­ing to its annual report for that year, 54 per­cent of which came from Pact Inc., a project funded by the U.S. Agency for Inter­na­tional Devel­op­ment. Nearly 36 per­cent came from Omid­yar Net­work, a foun­da­tion estab­lished by eBay founder Pierre Omid­yar and his wife. 1c. “Omidyar-Funded Can­di­date Takes Seat in New Ukraine Parliament” by Mark Ames; Pando Daily; 10/30/2014. Ukraine just held its first post-revolution par­lia­men­tary elec­tions, and amid all of the oli­garchs, EU enthu­si­asts, neo-Nazis, nepo­tism babies, and death squad com­man­ders, there is one newly-elected parliamentarian’s name that stands out for her con­nec­tion to Sil­i­con Val­ley: Svit­lana Zal­ishchuk, from the bil­lion­aire president’s Poroshenko Bloc party. Zal­ishchuk was given a choice spot on the president’s party list, at num­ber 18, ensur­ing her a seat in the new Rada. And she owes her rise to power to another oli­garch besides Ukraine’s pres­i­dent — Pierre Omid­yar, whose fund­ing with USAID helped top­ple the pre­vi­ous gov­ern­ment. Zalishchuk’s pro-Maidan rev­o­lu­tion out­fits were directly funded by Omidyar. Ear­lier this year, Pando exposed how eBay bil­lion­aire and Inter­cept pub­lisher Pierre Omid­yar co-funded with USAID Zalishchuk’s web of non­govern­men­tal orga­ni­za­tions — New Cit­i­zen, Chesno, Cen­ter UA. Accord­ing to the Finan­cial Times, New Cit­i­zen, which received hun­dreds of thou­sands of dol­lars from Omid­yar, “played a big role in get­ting the [Maidan] protest up and run­ning” in Novem­ber 2013. Omid­yar Network’s web­site fea­tures Zalishchuk’s pho­to­graph on its page describ­ing its invest­ment in New Cit­i­zen. Zal­ishchuk was brought into the NGOs by her long­time men­tor, Oleh Rybachuk, a for­mer deputy prime min­ster who led the last failed effort to inte­grate Ukraine into the EU and NATO. Zalishchuk’s pho­tos also grace the Poroshenko Bloc’s web­site and twit­ter feed, as she emerged as one of the pres­i­den­tial party’s lead­ing spokesper­sons. The lus­tra­tion law was passed under a wave of neo-Nazi vio­lence, in which mem­bers of par­lia­ment and oth­ers set to be tar­geted for purges were forcibly thrown into trash dumps. Zal­ishchuk, how­ever, praised the lus­tra­tion law, claim­ing that the legal­ized purges would “give Ukraine a chance at a new life.” Shortly before the elec­tions, on Octo­ber 17, Zal­ishchuk used her Omidyar-funded out­fit, “Chesno,” to orga­nize a round­table with lead­ers of pro-EU and neo-fascist par­ties. It was called “Par­lia­ment for Reform”and it brought together lead­ers from eight par­ties,includ­ing Zalishchuk’s “Poroshenko Bloc” (she served as both NGO orga­nizer and as pro-Poroshenko party can­di­date), the prime minister’s “People’s Party” and lead­ers from two unabashedly neo-Nazi par­ties: Svo­boda, and the Rad­i­cal Party of Oleh Lyashko, who was denounced by Amnesty Inter­na­tional for post­ing YouTube videos of him­self inter­ro­gat­ing naked and hooded pro-Russian sep­a­ratist pris­on­ers. Lyashko’s cam­paign posters fea­tured him impal­ing a car­i­ca­tured Jew­ish oli­garch on a Ukrain­ian trident. Last month, Poroshenko fur­ther cemented his ties to the extreme right by hail­ing Ukraine’s wartime Nazi col­lab­o­ra­tors, the vio­lently anti-Semitic UPA, as “heroes.” The fas­cist UPA par­tic­i­pated in the Holo­caust, and were respon­si­ble for killing tens of thou­sands of Jews and eth­nic Poles in their bid to cre­ate an eth­ni­cally pure Ukraine. Many UPA mem­bers filled the ranks of the Nazi SS “Gali­cia” Divi­sion. The neo-Nazi Right Sek­tor, which spear­headed the vio­lent later stages of the Maidan rev­o­lu­tion, sees itself as the UPA’s con­tem­po­rary suc­ces­sors; Right Sektor’s leader, Dmitry Yarosh, believes that any “eth­nic minor­ity that pre­vents us from being mas­ters in our own land” is an “enemy.” Yarosh was just elected to the new parliament. This week, Omidyar Network’s “investment lead” for Ukraine, Stephen King, accepted an award for Omidyar Network’s role in a major new USAID-backed project, Global Impact Investing Network. . . .
1d. “What Pierre Did Next” by Mark Ames; Pando Daily; 7/31/2015. In the 18 months since we broke the story, Ukraine has col­lapsed into war and despair, with up to 10,000 peo­ple killed and one and a half mil­lion internally-displaced refugees — and top US brass talk openly of a new Cold War with nuclear-armed Rus­sia, while US mil­i­tary advi­sors train and arm Ukraini­ans to wage war on Russian-backed separatists. Svit­lana Zal­ishchuk, one of the lead­ers of the Omidyar-funded NGO that helped orga­nize last year’s rev­o­lu­tion in Kiev, is now in power as an MP in Ukraine’s par­lia­ment, a mem­ber of the new, pro-NATO president’s party bloc. She’s gone from plucky Omidyar-funded adver­sar­ial activist, to head­ing a par­lia­men­tary sub­com­mit­tee tasked with inte­grat­ing Ukraine into NATO. I can’t think of another media tycoon who co-funded a pro-US regime change with Amer­i­can intel­li­gence cutouts like USAID and the National Endow­ment for Democ­racy. This week, Omid­yar Net­work announced yet another part­ner­ship with the National Endow­ment for Democ­racy and the Poyn­ter Insti­tute to cre­ate an inter­na­tional online fact-checking hub. Given the power that a monop­oly on “objec­tive” fact-checking offers, the tie-up with the NED takes the Omid­yar alliance with the US empire and media to newer, creepier lev­els. In yet another Omidyar-as-private-arm invest­ment, Omid­yar invested in the slick new Ukrain­ian media, Hromadske.tv, which was set up on the eve of the Maidan rev­o­lu­tion with ini­tial seed fund­ing com­ing from the US Embassy in Kiev. Omidyar’s involve­ment in Ukraine media and “fact-checking” is all the more seri­ous given that now Wash­ing­ton and NATO talk about “coun­ter­ing” Russia’s over­hyped “infor­ma­tion war” on the West and on Ukraine—this “infor­ma­tion war” which I cov­ered a bit in my piece on Peter Pomer­ant­sev, is con­sid­ered a top and urgent geostrate­gic pri­or­ity for NATO and the West. . . .
2. “In ‘Hindutva or Hind Swaraj’ a Warning Against Hindu Nationalism” by Vaibhav Sharma; The New York Times; 7/18/2016. The last months of U. R. Ananthamurthy’s life were tumultuous. One of India’s foremost novelists and political commentators, Mr. Ananthamurthy, who died in August 2014 at 81, had threatened to leave the country if Narendra Modi, then leading the nationalist Bharatiya Janata Party, won the vote in the national election. Mr. Ananthamurthy’s remarks drew vitriol, abuse and death threats from Mr. Modi’s supporters, and he remained under round-the-clock police protection for months. In June, a political tract Mr. Ananthamurthy wrote during the final stage of his life, the parting shot of a writer who devoted substantial time to warning of the dangers of Hindu nationalism, was published to widespread acclaim. More than two years after Mr. Modi’s election as prime minister, even as many continue to fear that India’s founding values of secularism and diversity are under threat, Mr. Ananthamurthy’s voice has served as an urgent reminder of the perils of majoritarianism and hyper-nationalism. . . .
. . . . Drawing on a formidable range of intellectual references, from Dostoyevsky to the epics of Hindu mythology, Mr. Ananthamurthy’s “Hindutva or Hind Swaraj” examines the two rival ideas that have shaped modern India: the plural nationalism originating from the struggle against British colonialism, led by Mohandas K. Gandhi; and the muscular, majoritarian nationalism favored by Mr. Modi and his supporters. Mr. Ananthamurthy compares the key texts of these dominant political strains: Mr. Gandhi’s “Hind Swaraj,” a riposte to British colonialism completed in 10 days, during a ship journey in 1909, and published a year later; and “Hindutva,” the 1923 founding text of Hindu nationalism, written by Vinayak Damodar Savarkar, a rightwing activist imprisoned by the British for his role in India’s freedom movement. “He felt the choice was really between these two ideologies,” Vivek Shanbhag, a prominent novelist and Mr. Ananthamurthy’s son-in-law, said of Mr. Ananthamurthy. “He was saying that it’s time that we, as a nation, stop now and take a look before we blindly move forward.” . . . .
. . . . “People like Modi,” Mr. Ananthamurthy writes, “live in a gumbaz, a dome that echoes what they say to themselves over and over again.” Mr. Modi’s election as prime minister has been followed by, as many feared, a climate of hostility toward minorities and renewed assaults on civil society and free expression. . . .
3. “In India, Another Government Critic Is Silenced by Bullets” by Jeffrey Gettleman and Hari Kumar; The New York Times; 9/6/2017.